Know the history of the Watchers and Watchtowers and why they are called upon in circle. If you don't know their purpose, why call? They are considered an old race who have gone past the need for physical bodies. Some claim they are light. There are legends that say they came from the stars. They are the ones known as the Watchers. It is claimed that each of the four Watchers reigns over one of the four directions of the circle. There were star cults in Mesopotamia around 3000 bce. One of the beliefs of these cults was that there were four major stars, each ruling over one of the four cardinal points. These stars where known as "Lords" or "Watchers." The Watcher of the East was the star Aldebaran.This star marked the time of the Vernal Equinox. The Watcher of the South was Regulus, marking the time of the Summer Solstice. Marking the Autumnal Equinox was Antares, Watcher of the West. The North Watcher was the marker of Winter Solstice, Foralhaut. Actual towers, called Ziggurats (cosmic mountains) were built as a form of worship. Each tower bore the symbols of the Watchers. During ritual celebrations the symbols were traced in the air with torch flames or wands, and the Watchers names were called. The Watchers were thought of as gods that guarded the heavens and earth. Lunar and Solar cults eventually replaced the Star cults. The Watchers became the gods of the four winds to the Greeks. The Christians took them over as "guardian angels." The Hebrews taught that all angels, known to them as Watchers, were ruled by four "higher" angels. They became the "Archangels" to the Cabalists. It is said Edward Kelly was a seer and alchemist, and John Dee was a sage. Kelly "received messages" from a group of beings of the spirit who claimed they were the same who had instructed Enoch. As Kelly received these messages, Dee wrote them down. His writings now compose the magickal system known as Enochian Magic. It is a system of angel magic influenced by Judeo-Christian beliefs. The doctrine of Enoch is mathematical. According to Dee and Kelly, there are 49 tables of large number and letter squares. There are 48 Gates of Understanding, one gate can not be opened. The 49 tables has 49 rows by 49 columns. 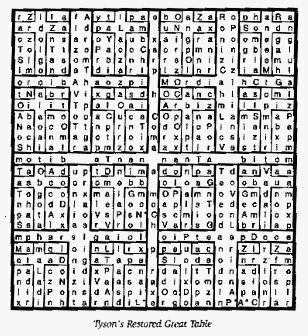 The directions of the angels, known as the Enochian Keys, were extracted from these charts. There are 48 "Calls" or "Keys" that open the gates of these "astral residences." These are symbolically represented by a large letter square. It is divided into four parts by a large cross, called "The Black Cross" by Dee (he had colored it black in his manuscript.) This large square of letters is called "The Great Table." This table is divided into four quadrants. These four quadrants are called the Watchtowers. You are able to access 12 astral cities through each Watchtower. The Watchers are the angels who live in these astral cities. In order for the angels to leave their cities and enter human consciousness the gates to the Watchtowers must be opened. Each city is represented in the table by a set of letters in numerical and geometric pattern. The four Watchtowers guard the 4 extremities of the universe. These Watchtowers are said to have been formed at the time Adam and Eve were expelled from the Garden of Eden. The Watchtowers contain all human knowledge and command the elemental spirits. They are said to also have the power of the transformation of things. They hold the secrets to all of mankind. The Modern use of Watchtower Elementals is said to be derived from the works of Dr. John Dee and Edward Kelly. It is also said that Aleister Crowley introduced Gerald Gardner to the Elementals (see below), who then wrote them into his own work. Many Wicca systems have their own versions of the Watchtowers and Watchers. Some see the Watchers as demi-gods, spiritual teachers, cosmic intelligence or beings composed of light. In some eclectic solitary systems, they may not be used at all. The Watchers are known as Lords, Elemental Rulers or Guardians of the Elements, Earth, Air, Fire and Water. These Elements are said to be populated by Elementals, a type of spiritual creature. The Gnomes populate the Element of Earth and are seen as "Little People" or green light. They are the givers of stability and material gain. They also protect circles cast outdoors. Sylphs are of the Air and are seen as fairies or white light. They hold the keys to knowledge, dreams and wishes, and are protectors of magickal applications. The salamanders inhabit the Element of Fire and may be seen as dragons or lizards. They are protectors of the home or business. Undines, the Elementals of Water, may be "merpeople", sirens, or pink light. Undines are protectors of the gates of death and karma. It is taught in some systems of magick that there are two sets of portals in a magick circle. Picture a circle within a circle. The inner circle contains Portals of the Elementals at the East, South, West and North. The outer circle contains the Portals of the Watchers, also known as Astral Portals. The corridor between the circles is known as "The World Between the Worlds." Some are taught that this dimension must exist for ritual and/or magickal energies to flow between the Worlds. The Elemental Portals represent the point of access to the Elemental Plane which exists between the Physical and Non-Physical, or Astral, Dimensions. The Elemental Rulers guard the Portals between this World and the Astral. Some consider it a circle within a square, with the Watchtowers at the outer corners. The Watchers are said to guard the direct access to the Astral Plane. Each Watcher has its own Watchtower. It is taught they have the power to cancel your magick. GreyWing does not agree with the above teaching. She does not use the Watchers, nor does she think they are necessary, but that is her opinion. She does call on the powers of the Directions. If a spell has not worked she feels it is not right to say "The Watchers were against my working." It is more likely that you were unsure of what you were doing, and your subconscious overrode your intended outcome. The mind is a powerful thing, conscious and subconscious. There are magickal gestures to announce that a magickal rite will be performed. Such a gesture is the drawing in the air of a Pentagram. These gestures, along with tools and clothing such as robes, are to get you into the proper frame of mind for magickal work, a signal to let your subconscious mind that something special is about to happen. The Watchers may be called upon to guard the Circle and witness the ritual to be performed. Every time you perform a spell you are sending out strong vibrations to the entire universe. No matter how good your intentions are, you may be at risk when you work a spell. For this reason some witches call upon the Watchers for protection. If in your self-initiation ritual you called on a Watcher to be with you, he/she will always watch and aid you in future magickal endeavors, if you so choose. They may also assist in a Wiccan's spiritual growth, but that too, in GreyWing's opinion, is actually in your own hands. If you are not ready, your mind will drift, letting you know the time is not right for you. Every time you perform a spell you use the essences of the four elements, earth, air, fire and water. For example, candle magick uses Fire and Air. It is important to know what each element means when you call on them. What do you mean by Air? You have to know which manifestation of Air you need for your working. This needs to be decided before you begin your circle so that the aspect of the element you wish to call is correct for what you are doing. Will you choose the Watchers or not? It is for you to decide. For more information, look for books on Enochian Magick.